Precious metals futures closed mostly higher in their start to the fresh trading week on Monday. Gold advanced for the first time in five sessions as U.S. stocks declined. Gold for April delivery climbed $4.90, or 0.4%, to settle at $1,196 an ounce on the Comex division of the New York Mercantile Exchange. The settlement is the highest since Wednesday, Jan. 25. "Gold prices ended the U.S. day session moderately higher on a corrective rebound from recent selling pressure that saw prices hit a three-week low last Friday," Jim Wyckoff, a senior analyst at Kitco Metals Inc., said in a report. 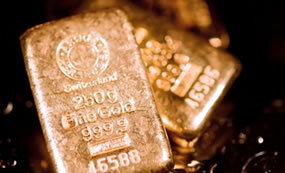 "A lower U.S. dollar index on this day also aided the precious metals market bulls. There was even a bit of safe-haven demand seen in the gold market." Gold futures ranged from a low of $1,190 to a high of $1,201.30. They fell 1.4% last week for their first weekly loss in five weeks. Ending higher for a second session in a row, silver for March delivery moved up 1.6 cents, or nearly 0.1%, to settle at $17.152 an ounce. Silver futures traded between $17.08 and $17.30. They advanced 0.6% last week, for their fourth weekly gain. April platinum tacked on $10.20, or 1%, to $993.50 an ounce, ranging from $978.20 to $995.10. Palladium for March delivery changed little, sliding 15 cents to settle at $738.45 an ounce. The metal traded between $726.10 and $742.90. Their prices were mixed last week — platinum gained 0.8% while palladium dived 6.3%. Gold rose $7.95, or 0.7%, to $1,192.80 an ounce. Silver gained 40 cents, or 2.4%, to $17.10 an ounce. Last week, platinum rose 0.2% while the other metal prices declined by 1.3% for gold, 1.1% for silver and 5.1% for palladium. United States Mint bullion sales advanced on Monday by 4,500 ounces in gold coins and 80,000 ounces in silver coins. When I can buy gold, silver, or plat. Eagles at spot I find it hard to pass it up. I have a lot to learn. My laptop is my best tool so I go all over the place. My guitar playing is getting put aside which I DO NOT LIKE! Playing gives me a way out from physical pain and mental frustration. The answer.. start playing more again. This is a great hobby and I have to just chill. ROCK ON!! By low, sell high gentlemen. I find at times better deal on bars than coins. Certain coins hold a higher premium but at the end of the day, raw precious metals are raw precious metals. The balance between numismatic low mintage coins and stacking bullion is a passion. Bars do make a lot of sense. Thanks. I haven’t posted in a few days due to computer problems, but bullion bars (ingots) are a lower cost way to go for “stacking”, but with all the coin & ingot counterfeiting going on you have to be careful of course. My favorite brands are the Royal Canadian Mint (RCM-branded) 10-oz & 100-oz bars & the Sunshine Mining & Minting Company (they supply the US Mint with most of their silver blank planchets) bars in 1-oz, 5-oz & 10-oz sizes. Good luck. Thanks for the added information. I’ll have a look at those. I’m glad I have you around here for this type of information. It really does come to good use to know about those places. So, I’m glad you’re back.